Ascending Butterfly: 'Spring Into Renovation' Giveaway featuring Mythic Paint and Accubrush! 'Spring Into Renovation' Giveaway featuring Mythic Paint and Accubrush! This giveaway is now CLOSED. Thanks so much to our wonderful sponsors ‘Mythic Paint’ and ‘Accubrush’! We look forward to working with you again! The winner is "~dab". We post winner usernames instead of full names. Official Winner Announcement can be seen HERE. Remember: There are still some great giveaways active on the upper right hand side of the page! Ƹ̵̡Ӝ̵̨̄Ʒ - We are a few days shy of the official first day of Spring. And you know what that means, Spring Cleaning! After getting rid of clutter and clearing out closets and drawers of stuff you haven't touched in 12 months (some even say 6 months), it's time to think of the rest of the rooms. It's time to paint and re-decorate! My favorite part of the whole process, is finally seeing a room transformed! My birthday is coming up soon (it falls on Easter Sunday this year), and as a result, I am taking the whole process of spring cleaning and renewal seriously. I am also trying to work quicky because I want to see it all completed BEFORE my big day. I like to start with high traffic rooms first, and for 'casa de butterfly' it's the kitchen! It gets the most visitors daily and the most foot traffic. It was also begining to remind me of a sanitarium. There had been a massive leak in my apartment and the landlord repaired the walls and white washed them. Meaning, All white paint all over, UGH! I couldn't take it! I decided I couldn't continue creating my culinary masterpieces in an all white kitchen! It was time for a change, an immediate change! Maybe it's the Aries in me, but I'm a strong personality type and I definitely like color. If I'm going to use color I want it to make a statement, I want it to inspire me. My favorite place to be inspired is by the ocean, and it's also a popular spring color this year! I am asthmatic and one of my biggest criteria for paint is low odor. I'm also very picky about how I want the room done, I want the paint color on the walls but the borders and ceiling white, which requires precision 'cutting' and is the most time consuming part of the whole process. I knew I wanted low odor paint, and I knew I would need to be able to 'cut' to get the look I wanted. Thankfully I found a way to get everything on my checklist! Ƹ̵̡Ӝ̵̨̄Ʒ - Mythic® paint is a non-toxic, ultra low odor paint that provides the durability and coverage you expect from a premium paint without the off-gassing VOC’s and cancer-causing toxins that emit years after drying. Stronger, safer, smarter paint®. Now that’s a breath of fresh air! 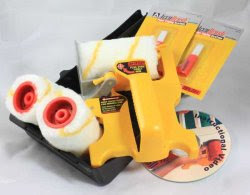 Ƹ̵̡Ӝ̵̨̄Ʒ - Patented Roller-brush combination - speed of a roller and the accuracy of a brush! I was supposed to film myself painting, but in all the excitement I forgot, but I did get some before and after photos of the kitchen to show you! My new blue walls are just what I need to get into a 'Spring' mind frame! I am a much happier cook now! I was pleasantly surprised by just how fast I was able to get this done with the Accubrush! It paints around crown moulding quickly and easily and it handled the tin ceilings with ease! I was also amazingly surprised that I did not have to open every window. When Mythic says, 'very low odor' I can tell you with confidence that they mean it, and it's accurate advertising! I am incredibly pleased with both the paint and the brushes! WIN IT! - Ascending Butterfly and our friends at Mythic Paint and Accubrush would like to provide one lucky winner with the opportunity to complete a Spring Renovation Project of their own! The Grand Prize winner will receive a color book (to help you pick the right color with accuracy! ), 2 gallons of Mythic Paint in winner's choice of color as well as 2 Accubrush MX Jumbo Kits with Video to get the job done quicky, easily and efficiently! (This is a $180 retail value!) - Not to mention the time savings of having the paint and brushes delivered directly to your door...priceless! Don't you just ♥ Mythic Paint and Accubrush? How to Win: (1) You must be a PUBLIC follower of Ascending Butterfly to be eligible for this and all giveaways. Indicate in your entry that you follow (if your 'comment name/user id' differs from your profile id, please let me know what name you follow under) and (2) Tell us what room you will be painting and Visit Mythic Paint and select your Paint Color Preference and leave the LINK to that color in your comment entry! (3) You must also leave your email address somewhere in your comment. (You can format it this way for security, example: ascendingbutterfly AT mail host DOT com, If it is visible in your profile, just say so, that's OK!). Please follow the easy 1, 2, 3 steps to winning! This giveaway is open to USA residents who are 18 years of age or older. I need to paint my bathroom and this would be perfect!! I follow Mythic Paint on Twitter. I watched the AccuBrush video on You Tube. I Viewed the Accubrush in Action on You Tube. I also would be painting the walls up our staircase. I follow. I'd paint my livingroom in Helios white OW-7-2. I follow on google. I would love to paint my bedroom with Orange Punch. I'm following Ascending Butterfly via: NetworkedBlogs, and Google blog friendconnect. I would be painting a wall of my room, the one opposite of the one with the window so people can peep in and appreciate it. It's kinda like I'm saying I appreciate peeping-Toms, which I don't. hah. I'll be painting my living room, and I think Fox Hunt (173-5) is the perfect color! I'd have to drag the computer into the living room though, because I'm trying to match the wall color to the floors (golden oak), fireplace, sage green furniture and a lot of dark woods! Oy! I already follow you on twitter (@simplydab) that's how I found out about this awesome giveaway!! And~if I win I would paint my living room in the Nail Paint! I would paint my son's room. He would love to have one wall in Spring Cosmos. Oh, this would be awesome, we're getting ready to close on a house that needs some painting (after we strip some wallpaper). I watched the Accubrush video on YouTube..what a neat idea...NO MORE TAPING!! whoohooo! I will be painting the master bedroom. Currently the color is dark chocolate brown i thought it would make it feel more romantic....grrrrrrr was i wrong. I follow! I will be painting my kitchen as well and I will be using Kiwi Breeze as my color! Following, I love the Plush Plum color for my bedroom, thanks! In first post I forgot to say- I'd redo bedroom, sorry. last tweet - no whammies! I would love to paint my bathroom in Spring Fresh green. 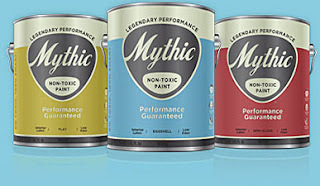 Since it's a closed space, the non-toxic, low odor Mythic Paint would be perfect to use. I follow publicly and my email address is in my account info. Extra credit:You successfully fueled the following blog: http://ascendingbutterfly.blogspot.com. Subscribe to receive Ascending Butterfly emails with the Feedburner widget. I am a public follower of you (ardy22). I'm following safepaint on Twitter (I'm @ThriftyJinxy). I follow your blog. I would paint my bedroom in the Pink Precious color.